Émile-Jacques Ruhlmann, the designer of this commode, produced a number of luxury furniture pieces throughout the 1920s and early 1930s that represent the pinnacle of French Art Deco design. His work often imbued historical cabinetmaking techniques and forms with a vibrant and modern spirit. Though he achieved notoriety for his furniture, his firm also produced a number of other items such as textiles and lighting. By working in a variety of media and forms, his practice embodied the idea of designer as ensemblier or interior decorator. His work at the 1925 Exposition Internationale des Arts Décoratifs et Industriels Modernes—the exhibition from which the style “Art Deco” takes its name—represents this shift. At the 1925 exhibition he showcased his work in the Hotel d’un Collectionneur, a model interior that presented a hypothetical living space for a wealthy connoisseur. In the bedroom he included the Lasalle commode which is nearly identical to the Collete commode seen here. Named after French writer Collete, this commode is characteristic of Ruhlmann’s most famous work and, therefore, of French Art Deco furniture, in general. Ruhlmann’s firm sold this commode in dark woods such as walnut, amboyna wood, and bur ash, as well as mahogany, as seen here. The diamond-patterned ivory inlay decoration seen on the front of the commode extends seamlessly across the two drawers, creating the illusion of a single panel. 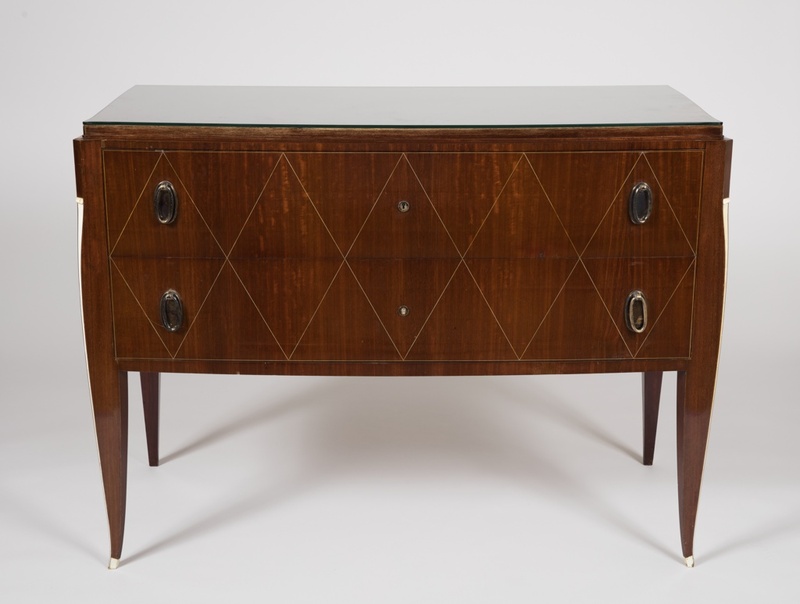 Though Ruhlmann used geometric forms (as seen in the ovular drawer handles and diamond pattern, for example) the overall form is not geometric but rather uses subtle curves. The exquisite craftsmanship and use of luxury materials in this commode make it clear as to why Ruhlmann has been posthumously dubbed both a “genius” and “master” of Art Deco.